Science Fiction Romance breaks down these barriers to diversity in many ways. The most obvious way SFR authors “seek out new life and new civilizations” is that often those who write SFR are women and we give a voice to what have often been underdeveloped female characters. Romance by its definition provides a voice for women’s desires, but not to the detriment of male characters. It’s pretty common practice these days for Romances of any subgenre to showcase two points of view: the heroine and the hero. Science Fiction and Science Fiction Romance present an opportunity to embrace the “other,” whether that other is the other gender, the other ethnic group, the other sexual orientation, or the other from another planet. From the many Danger Gal profiles I’ve written for my own blog, I’ve been confronted with asking myself as a writer and a reader: Why is this character this gender? Why is this character from this ethic group? Do these elements enrich the story or are they just default self-limiting tropes? These questions are part of a story’s world-building and should contribute to its depth. Joss Whedon turned a gender and ethnic stereotype on its head with the character of Buffy Summers, who as a white, blond, teenage cheerleader bears a constellation of characteristics that form a proverbial bunny rabbit of timidity. Then he turned her into a vampire slayer, the one person in the world all evil should be afraid of. 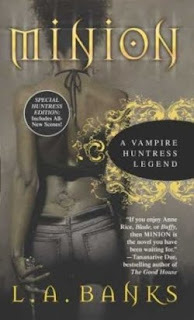 L.A. Banks’ Vampire Huntress series (the first of which is MINION) turns this idea around again with her portrayal of spoken-word artist and vampire slayer Damali Richards and her cadre of Warriors of Light who face-off against a master vampire. In SPIN STATE, author Chris Moriarty subverts all sorts of stereotypes with main character Major Catherine Li, a bisexual female United Nations Peacekeeper trying to hide her genetic construct nature and solve the murder of physicist Hannah Sharifi. Make your character’s gender and ethnic background work to enrich your story. Have a reason for who your characters are. You may find a whole new way of looking at the world. As Science Fiction readers and writers we need to constantly ask ourselves the “what if”: What is the main character of this story were female and black? Or Asian? SFR provides unique opportunities to explore these elements through relationships. What are some of your recommendations of Science Fiction Romances that examine and overturn ideas in gender, ethnicity, and sexual orientation? Lisa Paitz Spindler is the alter ego of Danger Gal, whose stiletto heels are licensed weapons and who keeps Ninja stars in her bra. Lisa, however, gets through each day on steady infusions of caffeine and science blogs, while constantly trying to beat her Free Rice high score of 45. Occasionally she writes science fiction and designs web sites.